For a pediatric nephrology fellow, this is the kind of consult we often do in our sleep. This is one of the most common consults we get, when an infant has a blood draw and is found to have hyperkalemia with no other explanation such as AKI, CKD, endocrine disruption (always check the newborn screen! ), or medication side effect (ACE inhibitors, NSAIDs, beta-blockers, and trimethoprim-sulfamethoxazole are common culprits we see). Often if the serum level is elevated we’ll check a whole blood potassium level as this is less likely to have hemolysis during processing and is less reflective of potassium released by platelets during the clotting process in serum sample preparation. Potassium homeostasis in infants (and children in general) is different than in adults. Unlike in adults, who must balance potassium intake and excretion, children need to be in positive potassium balance to ensure adequate somatic growth. There is a developmental immaturity of the kidneys with an end result of a decreased potassium filtration fraction and limitation on the ability to excrete an acute potassium load. Some research suggests that renal potassium handling in children may not reach that of adults until they reach early adolescence. The distal nephron is the major contributor to the physiologic hyperkalemia seen in infants. This segment of the nephron is relatively resistant to mineralocorticoids, and infants have physiologically higher levels of plasma renin and aldosterone levels as a consequence. 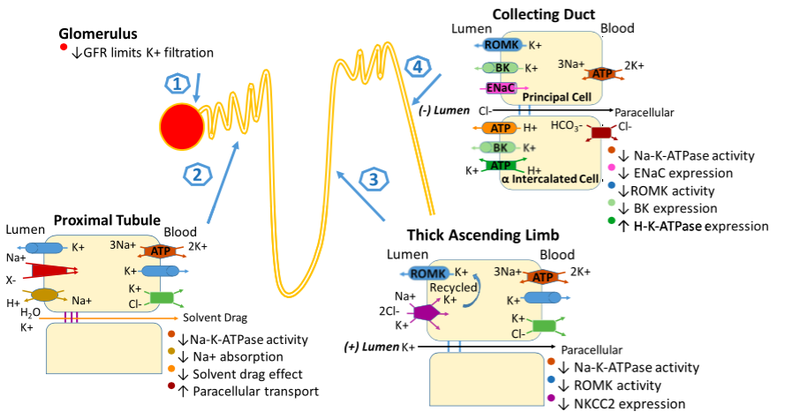 In addition, the distal nephron has decreased expression of two key apical membrane channels, the ROMK and maxi-K (or BK) channels, which permit potassium efflux down its concentration gradient from the intracellular space to the luminal fluid. Whereas ROMK is important for basal potassium excretion, BK activity is augmented by increased urinary flow through the distal tubule. There is also low expression of the epithelial sodium channel (ENaC), which is localized to the principal cells of the collecting duct. This limits potassium efflux in response to the generation of a negative luminal charge when sodium passes through ENaC. Finally, throughout the whole nephron, infants have decreased Na-K ATPase activity which diminishes the concentration gradient to allow for effective transmembrane sodium and potassium exchange. Developmental differences in neonatal and infant renal potassium handling compared to the adult nephron. From Pediatr Nephrol (2017) 32:2037–2049. So how do we overcome this physiologic immaturity of the kidneys and manage hyperkalemia in these infants? Give some salt! If you were to check the urinary sodium concentration in these infants, a majority of the time the level will be low or undetectable. Breast milk or formula that infants consume has low sodium content and exacerbates the problem. A small amount of sodium chloride supplementation is often enough to increase Na-K ATPase activity as well as activate the ENaC channels on the principal cells of the collecting duct to drive potassium into the final urine. In an emergent situation, when an infant has hyperkalemia with EKG changes with or without hemodynamic instability, emergent measures are needed to protect the heart (calcium gluconate) and rapidly promote transcellular shift such as insulin/dextrose, albuterol, and sodium bicarbonate. 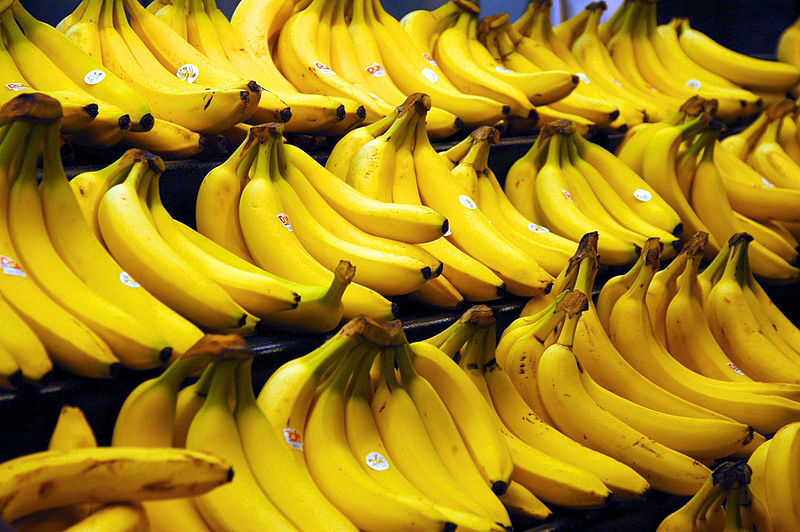 However the ultimate goal is to remove potassium from the body, which can be through the urine (e.g. loop diuretics) or the GI tract (e.g. sodium polystyrene sulfonate). Despite its usefulness in these situations sodium polystyrene sulfonate is avoided by some institutions, especially in neonates, because of the small but real risk of intestinal necrosis. For infants with stable hyperkalemia, pre-treating the formula or breast milk with sodium polystyrene sulfonate powder is preferred and effective. Though patiromer is now being used for hyperkalemia in adults, the absence of studies in infants and children makes it not quite ready for primetime. *Note: The above post does not constitute medical advice. It is commentary on how I approach hyperkalemia in neonates and infants and is provided for educational purposes only.